The 30th Amendment to the Irish constitution, to give more powers of investigation to the Dublin parliament [Oireachtas], has been defeated in a shock reverse for the coalition government. Michael D Higgins has finally been declared elected as President of Ireland following the fourth and final count in Dublin Castle this afternoon. 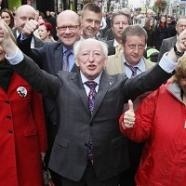 Labour Party candidate Michael D Higgins is now certain to be inaugurated the ninth 26-County President and will be declared elected later tonight, when the results of the final election count are revealed in Dublin Castle. 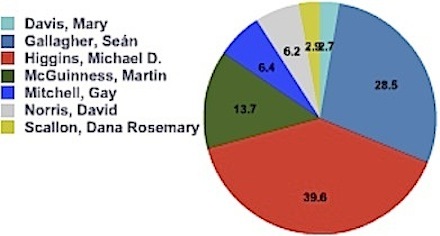 Labour veteran Michael D Higgins is likely to win the 26-County Presidential election over independent Sean Gallagher with the help of transfers from a strongly placed Martin McGuinness of Sinn Fein, according to early tallies of votes coming in from constituencies across the State. Catholics prisoners in the Six Counties are far more likely to be subjected to violence (or prison ‘discipline’) than their Protestant counterparts, a new report has revealed. Two referendums to be put to the voters of the 26 Counties on Thursday, the same date as the Presidential election, are facing increasing criticism over the lack of public debate as well as the content of the constitutional changes proposed. The 32 County Sovereignty Movement has said it has been made aware of more approaches by MI5/Special branch who have been actively targeting “vulnerable” members of society in an attempt to recruit them as informers. An appeal is to be launched after Louth man Michael Campbell was sentenced to 12 years in a Lithuanian prison following an MI5 sting operation. As well as voting in two referendums and the presidential election on Thursday, the constituents of Dublin West will be voting in a by-election to fill the seat vacated by the death of Brian Lenihan earlier this year. Gallagher is part of the Fianna Fail machine even if the tracks of his party membership have been covered with a floor mat upon the face of which ‘independent’ is brightly stencilled. 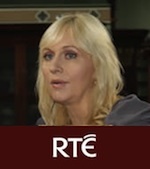 British Intelligence agencies sent the wife of a former IRA prisoner an envelope stuffed with cash in an extraordinary attempt to recruit her as an informer. 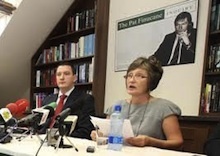 The family of Pat Finucane have released documents which confirm the British Prime Minister deliberately reneged on a promise to hold a public inquiry into the murder of their loved one. 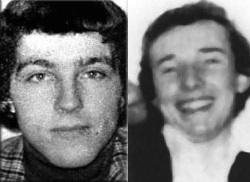 The highly controversial Police Ombudsman in the North, Al Hutchinson, refused a request by former police chief Hugh Orde to investigate allegations that IRA informer Freddie Scappaticci was ordered by his handlers to kill other IRA Volunteers. A confidential British government document has been unearthed that describes one of the most painful incidents of the conflict, resulting in the deaths of three children, as a “carefully planned operation” and “a major success”. 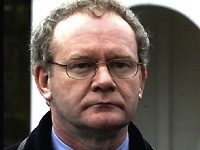 Families of some IRA men executed by the British Army have accused Martin McGuinness of betrayal as he attempts to woo voters in the South’s Presidential campaign. 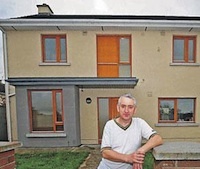 He was on the housing list for five years and, out of desperation to find somewhere to call home, eventually resorted to squatting in one of the thousands of empty houses in ghost estates littering Ireland. Sinn Fein President Gerry Adams spoke at the International Conference to promote the resolution of the conflict in the Basque Country, in San Sebastian on Monday. At the very least you would have expected Cameron to reflect in his attitude and demeanour the reality that in front of him was a grieving family whose father and husband was killed by those in the British government's pay. The Basque armed group ETA has issued a statement tonight saying it is ending its 43-year armed campaign for independence, and calling on Spain and France to open talks. The ‘UK City of Culture’ offices in the centre of Derry was badly damaged on Wednesday night by a small but powerful ‘Real IRA’ bomb. Presidential candidate Martin McGuinness has said that an election debate on state-run RTE television on Wednesday night amounted to a “trial by television”. A couple have fled their east Belfast home after a sectarian attack by a loyalist mob left their young daughter injured. An internet-based campaign of peaceful resistance to the political and economic corruption of the 26-County state has taken to the streets. The family of Kevin McDaid has described a decision to drop murder charges against seven men accused of killing him as “an insult” . The text of the speech delivered by Presidential election candidate Martin McGuinness at the Mansion House event in Dublin on Thursday night. Two contrasting views about how republicans can attempt to come to terms with political change. The widow of murdered Belfast defence lawyer Pat Finucane said today she felt “angry” and “insulted” after David Cameron told her he was proposing a review of her husband’s case by a QC (British government lawyer). 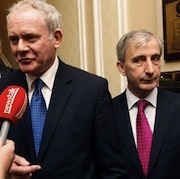 A hysterical attempt by Fine Gael and their media allies to attack Sinn Fein’s Martin McGuinness has seen a surge in support for Mr McGuinness’s campaign and propelled Sinn Fein into second place in the polls. 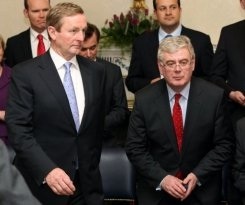 The coalition government in Dublin has defended their decision to give further bonuses, deferred payments and inflated salaries to bank executives, property developers and political insiders. A prominent member of eirigi was detained for seven hours and charged with a string of offences after he intervened to check on the welfare of a neighbour who was having his car searched by the PSNI. Britain’s Direct Ruler in the North, Owen Paterson, has dismissed Sinn Fein’s long-standing call for a truth commission to deal with the North’s past. There have been increasing calls for a referendum to allow northerners and emigrants the right to vote in the Irish presidential election. The brother of Sinn Fein President Gerry Adams is to appeal against his extradition to the North following a High Court decision that he should stand trial in Belfast on allegations that he sexually abused his daughter. 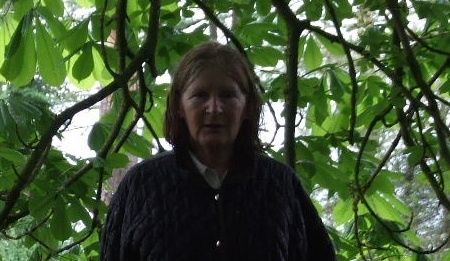 On Thursday Teresa Treacy was released from jail, still vowing to protect what is left of her carefully nurtured wooded estate from the pylon men and their diggers. A carefully constructed a narrative about the origins of the 26-County state is being challenged.